Fluid therapy might just be the most important medical therapy we perform on sick animals. Dehydrated pets feel ill, cannot fight disease, do not eat well, and cannot metabolize drugs efficiently. Dehydration decreases the circulation to two very important organs, the liver and the kidney. These organs are then unable to perform vital functions, some of which include detoxifying drugs and removing waste products. We give fluids to a wide variety of species in addition to dogs and cats. They can be ill, and need fluids for many different reasons. 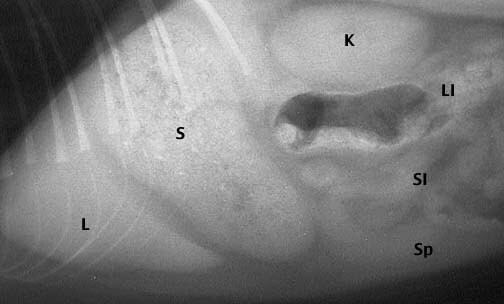 This guinea pig being examined by one of our externs has a problem with overgrown teeth and cannot eat well. This has caused him to become dehydrated, and in need of supplemental fluids. Before coming in for treatment this rabbit was painful from a broken leg and not eating well, so it became dehydrated. Supplemental fluids to correct the dehydration, and a splint to take away the bone pain and allow the healing, were needed to get him back to being a normal bunny again. You can see how we treated his fracture here. Yup, we even give fluids to 120 pythons when they are ill or dehydrated. This is probably not something you want to try at home! Before we get started on the specifics, lets go over a little background on fluids. The body weight of a normal dog or cat is about 60% water, puppies and kittens are up to 80% water. These numbers show the importance of a proper fluid balance for normal physiology, especially in puppies and kittens when these animals become dehydrated. Inside the cells of an individual organ, called the intracellular space. 65% of the total fluid in the body resides in this intracellular space. In the bloodstream, called the intravascular space. 25% of the total fluid in the body resides in bloodstream. In the tissue surround the cells, called the interstitial space. 10% of the total fluid in the body resides in the interstitial space. When the intravascular fluid is low hypovolemia results. Hypovolemia means the body cannot deliver adequate oxygen to the cells, and a pet can go into shock. If not treated death can ensue. We assess this low oxygen problem with an instrument called a Pulse Oximeter, which measures the oxygen saturation of the hemoglobin molecule in the red blood cells. It should be in the 90 percent range. Elevated heart rate, called tachycardia. Slow heart rate, called bradycardia. This occurs when your pet is in the act of dying. Weak peripheral pulses. We detect this on an exam by palpating the femoral pulses while simultaneously listening to the heart. Prolonged capillary refill time (CRT). For a normal animal this should be under 2 seconds. A blood sample will also give clues to dehydration, especially the total protein level and the hematocrit. After the hematocrit is measured we break the tube in the middle and place the serum on an instrument called a refractometer to check the protein level. In conjunction with the history, exam findings, and hematocrit level, the protein level helps us determine the degree of dehydration. Hypovolemia and dehydration can occur independently. A dehydrated patient might not be hypovolemic, and a hypovolemic patient might not be dehydrated. The normal (called maintenance) amount of fluid your pet needs every 24 hours to maintain normal physiology (called homeostasis). For a dog this is 60 ml for each kg of body weight. For a 20 pound dog this is 545 ml (1/2 of a liter, or 30 ounces) per 24 hours. For a cat this is 45 ml for each kg of body weight. For a 10 pound cat this is 204 ml (0.2 liters or 7 ounces) per 24 hours. A 20 pound pet that is 7% dehydrated needs 600ml to correct this dehydration. This is more than pet owners realize, and why proper fluid therapy is so important when we hospitalize your pet. Ongoing fluid losses like vomiting or diarrhea. As pet that has been burned has tremendous fluid losses due to seepage of serum at the burned skin area. This ongoing loss is subjective, but it needs to be added to the calculation above if your pet continues to have these fluid losses. Signs of dehydration include lethargy, anorexia (poor appetite), sunken eyes, sticky gums, constipation, and a general feeling of malaise. It is diagnosed based on a history of anorexia, vomiting, diarrhea, or extra fluid loss, in combination with a physical exam and diagnostic tests. During an exam a dehydrated pet will shows signs of dehydration when the problem is greater than 5 %. The page talks about the two primary methods used to give fluids to pets. The first is intravenous, and is performed only by us in the hospital. This is not a treatment method you will do at home. The type of fluids we will be describing are called crystalloids. This are the kinds most people are used to, and are usually lactated ringers solution (LRS) or sodium chloride (NaCL), and variations thereof that we might use in specific situations. Another type of fluid is called a colloid (hetastarch or hydroxyethyl starch). Colloids are used only in specific situations, which are not common. For the remainder of this page we will be referring to crystalloids. I.V. (intravenous) catheters are used extensively in pets that are sick or those pets that are about to be anesthetized. These catheters allow us to administer medication directly into the venous system for rapid distribution to the whole body. Medication given this way acts faster and is more controllable, a significant advantage for an ill pet or in an emergency. IV administration of fluids is critical in pets that are hypovolemic. Intravenous fluids are important during surgery. We monitor this closely in many ways, especially with the blood pressure. If your pet is ill and staying in the hospital, or about to undergo anesthesia for any reason, an I.V. catheter to allow fluid administration is one of the most important therapies we can institute, and can literally be life saving. This dog getting his teeth cleaned was put on IV fluids before the procedure to stabilize the kidneys for the anesthesia. The fluids are continued for the duration of the procedure, and will be administered until this pet is fully awake and its owner is picking it up. The placement of the catheter requires technical skill and knowledge, particularly in small or dehydrated pets (the veins in these pets are small and damage easily). Improper placement of the catheter can literally cause more harm than good. Our nurses excel at placing I.V. catheters in all species. Because the catheter is introduced directly into the venous system, it must be placed in an aseptic (sterile) manner. The hair over the vein is shaved, and special tape is placed over the catheter. Comfort is also important when placing the catheter due to the small nature of some of our patients, and the duration the catheter must stay in the vein. This tape and catheter is constantly monitored by our staff for comfort and sterility. After 3-5 days we usually replace the catheter in order to minimize the chance of the catheter causing an infection. Cephalic Vein-This is by far the most common vein to use. It runs along the top of the foreleg of dogs and cats. 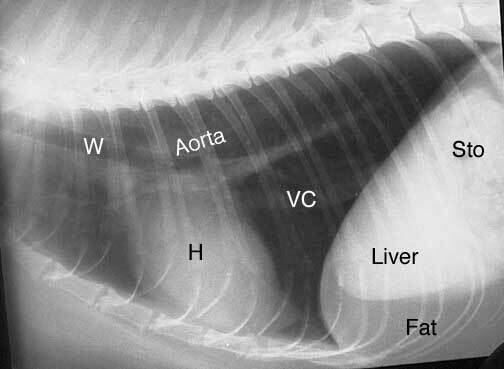 The illustration below shows the placement of this catheter in a large dog. Jugular vein-This vein is in the neck. A catheter placed in this vein allows longer term use and the ability to give larger volumes of medication with different viscosity’s. Saphenous-This vein is on one of the back legs. It is mostly used when the cephalic vein is unusable, but can be used at any time. Various other veins are sometimes used, by they are reserved for some of the more unusual species of animals we deal with. In some of these pets like birds, that have minuscule seized veins, we cannot give the necessary emergency fluids intravenously. In these cases we use what is called an intraosseous catheter. This catheter goes directly into the bone marrow, and allows us to give the necessary fluids to a small creature rapidly and effectively. In birds it is put in what is called the tibia tarsal (tiboitarsus) bone. This is equivalent to our tibia or shinbone. It is put in at the knee joint. This radiograph shows the placement of an intraosseous catheter. It is going down the shaft of the tibiotarsal bone in this bird that came in collapsed and in shock. The bird responded and recovered completely after we administered fluids through this catheter. Your pet’s catheter will stay in for the duration of its hospitalization or procedure, and will not be removed until you return to pick up your pet. Your pet may go home with a small piece of tape and cotton where the catheter was. It can be removed several hours later after you return home. We use many different types of fluids, the most common one being Lactated Ringer’s Solution. The amount of fluids given are calculated and monitored carefully. We use a special fluid pump that gives a consistent amount of a period of time. Each patient receiving fluids has a custom fluid chart outside its cage for close and constant monitoring of the fluids. Our doctors make adjustments in the type and amount of fluids as diagnostic tests like blood panels, and your pet’s response to treatment, are analyzed. The second method used to administer fluids is subcutaneously (under the skin) between the shoulder blades. The administered fluid slowly absorbs over several hours. In this hospital and on an out-patient basis, this method is used for pets that are not seriously ill, but just need some additional fluids to maintain hydration, fight a fever, or stimulate the appetite. This section on SQ fluids contains detailed step-by-step descriptions on how to give fluids at home on an ill pet, an older pet, or a pet with kidney disease. When you first read it you might think there is no way I can do all of that. Once you observe us do it in front of you, and then do it yourself, you will realize it is not anywhere is difficult as you think when you read about it the first time. This video is how we give sq fluids at our hospital. Notice how calm this dog is. SQ fluids are of special benefit for pets that need long term fluid administration at home, usually older (geriatric) cats or those with kidney disease. This is the animal version of dialysis in people, and it works extremely well. These fluids at home are highly beneficial, and have had cats with chronic kidney disease do well for years with this treatment at home. If your doctor feels your pet needs SQ fluids at home you will be taught how to administer them by our nursing staff. At first it might seem an impossible notion to give your pet fluids at home. Not only is there the psychological fear of using a needle, or worry about hurting your pet, there is also a worry that your pet will not stay cooperative long enough for the few minutes it takes to give the fluids. Rest assured that you will not be forced into giving these fluids if you feel uncomfortable, although we have yet to encounter a client that was not able to perform this procedure at home. This is because we have extensive experience in this area, and we teach you at your own individual pace. Only when you feel you are ready will you proceed on your own. You will be given as many personal demonstrations as necessary, and can return to the hospital at any time for further demonstrations or to make sure you are performing the procedure properly. You are welcome to bring your pet in at any time for assistance in giving the fluids, so do not feel you are on your own. If you are out of town, your house sitter can bring your pet in for these fluids. We consider you part of our nursing team and are willing to give any assistance needed. Before you are given a live demonstration the following basics will help prepare you. The scariest part of the whole procedure for most people is the actual insertion of the needle into the skin so that the fluids flow under the skin (SQ). You will watch us do this as many times as you need to overcome any fear you might have. When you realize it is not all that difficult by watching us do it, we will hold your hands when it is your turn if needed. Practicing by inserting a needle into an orange or similar fruit can be helpful. Different sized needles, ranging from 22 gauge to 18 gauge, are used to give SQ fluids. During the demonstration we will show you which one works best for your pet. The 18 gauge needle, at the top, has the largest diameter. Fluids flow fast through this needle, taking less time to give them. If this size needle is uncomfortable for your pet, we will try the 20 gauge next because it is smaller, although the fluids will flow more slowly. On small pets we might even use the 22 gauge needle. During this demonstration you will be told exactly how much fluids to give. For most cats with chronic kidney disease, this is 100ml once or twice daily. The fluid bag has 1000ml (1 liter), so for the average cat you will be able to give these fluids for ten days. This might vary depending on many factors, and your doctor will determine the amount and frequency. Do not change this unless instructed to. Keep children and other pets away if they are disruptive during the process of giving the SQ fluids at home. Have all of your equipment readily available, usually on the same table as your pet. Depending on the size of your pet, the table should be around waist to chest high. It is helpful to set up one area of your house to give the fluids. Hang the fluid bottle in this room for easy access. It should be at least a few feet above the table for optimum flow. You will be shown how to set this up by one of our staff. Store the fluid bag at room temperature and cover the bag so no light hits it. We sometimes add medications like vitamins and electrolytes to the bag, and light can affect them. When you purchase a fluid bag from us it needs to be set up with the IV line. We will show you how to do this in person. You only need to set it up when you purchase a new bag. After that, you give the fluids with a new needle each time, keeping the IV set attached, until the bag is empty. Never use the needles more than once since they are sterile and very sharp when first opened. Repeated use could cause an infection in your pet, and makes the needles dull, causing discomfort on administration. Needles are inexpensive, so don’t take the chance by re-using them. When you purchase the bag it comes wrapped in a plastic wrapping. Remove the wrapping at home when you are ready to set it up to give fluids to your pet. After you remove the outer wrapping lay the bag on your table or hang it from a coat hanger. The large white end with clear receptacle goes into the fluid bag once the white cap is removed. The clear container above will be filled part way with fluid once attached. At the opposite end of the IV line is a small blue cap. You remove this blue cap when you attach a needle, which you will learn about later. The large blue plastic piece in the center allows you to turn the flow on and off, and also adjusts the rate of flow. Make sure the white wheel is in the off position like this when first setting it up. Remove the white plug from the bottom of the bag. The cap is in solidly, so you will need to pull hard to remove it. You can do this while the bag is hanging, or while it is laying on the table. Discard the white cap, it will not be used again. Remove the white cover from the IV set receptacle. It is sterile, so do not touch it to anything at this point. Hold the hanging bag steady, or lay it flat while doing this, so you can put it straight in without touching anything else. Remove the clear plastic at the base of the needle by twisting it either direction. The open base of this needle is sterile, so do not touch it to anything until you insert it into the IV line. Remove the blue cover at the end of the IV set. Turn the fluids on and let a few seconds of fluids flow through the IV line to remove the air. Let these few drops flow into a small bowel or on to a towel. Do not touch the end of this line to anything. Insert the needle straight into the opening. Hold you left hand still as you twist clockwise with your right hand to lock it tight. Hang the IV set over the fluid bag. You are now set to give the fluids. Every pet reacts differently to the actual giving of the fluids, and they feed off of your emotions, so cool and calm usually works best. If either one of your gets worked up, stop and try again later. Make sure the location to give the fluids is subdued and calm, with no excessive lighting or noise to alarm your pet. Take your time by bringing your pet to the table and interacting with it by petting it and holding it. You can even feed it while giving the fluids. A towel for restraint, or another person holding the head, might even be appropriate. Hold your pet to the side, make a small tent of the skin between the shoulder blades, remove the cap over the needle, and rapidly insert the needle between the shoulder blades in one motion. Insert it all of the way in until the hub touches the skin. Turn on the fluids completely on by moving the white wheel all the way to the top, and give the prescribed amount of fluids. For most pets, this takes only a few minutes of your time daily, a few minutes of your time that will be highly advantageous to your pet. When you are finished giving the fluids remove the needle from your pet and cap it. Remove the used needle and place a new sterile needle at the end of the IV set, and hang the IV set over the bag as before. You are now ready to give the fluids again the next time one of our doctors prescribes. Finally, pat yourself on the back for a job well done, have a seat, and breathe deeply (or get a stiff drink if needed to calm your shaking hands). A problem can occur where the blood flowing to and through the liver has a problem. There are several variations on this problem blood flow. In this page we will be correcting the blood flowing from a blood vessel that is directing the blood away from the liver and not into the liver like it should. This is called a liver shunt, also known as a porto systemic shunt (PSS). 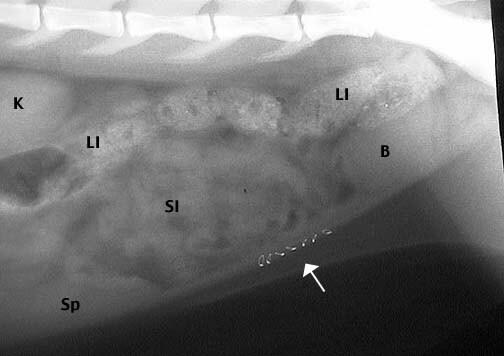 This page shows a surgery to correct an extra-hepatic PSS (porto systemic shunt) in a cat using an ameroid ring. More than one year after surgery this cat is doing fine, so the surgery was a major success. The same procedure would be used in a dog, a species that gets this problem much more often than a cat. Once our diagnosis was confirmed we put our little friend on medication to minimize the symptoms and make him a much better candidate for surgery. You can learn all about how we diagnosed and treated this problem before surgery on our Liver Diseases Page. Graphic surgery photos on this page. Dr. Adam Gassel of the Southern California Veterinary Specialty Hospital performed the surgery. This surgery is not performed by any veterinary surgeon. Dr. Gassel has the special training, expertise, and experience to perform this delicate procedure. Aftercare is just as important as surgery in correcting this problem surgically, so this surgery needs to be performed at a 24 hour veterinary hospital where the staff is trained in this care. The ameroid ring is made of casein (a type of protein) that is surrounded by a ring of stainless steel. Over 4-5 weeks the normal fluid in the abdomen causes the casein to swell. Since it is encased in metal, the swelling slowly occludes the blood vessel with abnormal blood flow to the liver. It is important that the casein swells slowly to allow the liver to adjust to the new pressure within it from the other blood vessels that are now increasing their blood flow to the liver. If the problem blood vessel decreases its flow to the liver too fast there can be serious consequences and even liver failure. This surgery is performed after a careful review of all data and a discussion with the owner of the possible complications due to surgery. Cats tend to have more post operative complications compared to dogs, so special care is paid to their needs to help ensure a successful surgery. Dr. P watched the surgery and took these photos to help explain this procedure. The abdomen is entered at a special location in the muscle called the linea alba. This is where two tendons of the abdominal muscles come together. This area is stronger than muscle tissue, and will hold the final sutures when we put the muscle back together at the end of the procedure. This will prevent a hernia. As soon as the abdomen is entered the swollen and yellow discolored liver appears. You can see it between our surgeon’s fingers. The liver is this way because of the disease process going on. Finding and exposing the extra hepatic blood vessel for correction amidst all of the blood vessels, fat, and tissue in the area is tedious, and takes delicate dissection to get the vessel completely exposed for the Ameroid Ring to be placed. This is where Dr. Gassel’s expertise comes into play. After much dissection you can see him starting to expose the vessel with his instrument. The extra hepatic blood vessel is the reddish horizontal object under the swollen and yellow-colored liver. The next important part of the procedure is picking the correct sized Ameroid Ring. If it is too big it won’t occlude the extra-hepatic vessel enough to help. If it is too small it will occlude the blood flow too rapidly and cause the liver to fail. One of the ways we diagnose a PSS is with a bile acids test. After surgery the bile acids test should be back to normal. We are happy to say that after over one year our patient’s bile acids test is back to normal and he is feeling great! This was the original bile acids test on this cat. It should be less than 13, and is over 135. To have it go from this, to perfectly normal, is a testimonial to the expertise of the surgical team at the Southern California Veterinary Specialty Hospital. There is much more to liver shunts, which you can learn about on our Liver Diseases Page.